Some of you out there didn't trust that Michael Brantley was the best fantasy outfielder going into the 2015 draft, but he had another great season, less the 25 games he missed. Everything else was right on pace for another huge season. In terms o outfielders, there's just too much data to go through, here, so draft at will. Mike Trout, Bryce Harper, Andrew McCutchen, and, yes, Michael Brantley... and then there's Giancarlo Stanton who had a great comeback year (until he got injured again), Adam Jones, Yoenis Cespedes... as we said, the list goes on and on. This year's list will get a pretty good shuffle, but among the top outfielders, you know who to draft in 2016... or do you? Top 50 outfielders in the standard 5x5 categories. Top 50 outfielders projected to 600 At Bats. This one's a "duh." This is arguably the most-reliable source of fantasy baseball information available: the rankings in the standard 5x5 stats of Runs, HR, RBI, SB and Batting Average. It also lets you know who (mostly) played a full season and who put up the best fantasy numbers during that full season. What it doesn't tell you, however, is who was on pace for a top-notch fantasy performance before being cut down by an injury. Projecting everyone out to an even playing field (i.e. : 600 at bats) doesn't just let you know who was on pace for what in terms of fantasy performance. More importantly, projected stats let you know what you can expect out of a player when he's in your lineup. Remember that you may only have a certain outfielder in your lineup for a few days at a time when he has a good matchup, or for a few weeks while he fills in for an injured player on your roster. While you may not benefit from a full season of stats, looking at how players compare to each other when it's apples-to-apples will let you know what you can expect from a guy when he's in your lineup. For instance, Steve Pearce ranked 35th among all fantasy outfielders in standard, season-long 5x5 stats, however, he accumulated those stats in just 102 games and just 338 At Bats. Projected out to 600 AB, Pearce suddenly jumps up the rankings to #14 among all fantasy outfielders, a clear indication that his stats - while actually in your lineup - will make a much more significant impact than, say, Khris Davis who put up slightly better overall 5x5 stats, but it took him an extra 163 At Bats to get there when compared to Pearce. Of course, there are cases where the 600 At Bat projections are a bit skewed from a player having a short, yet awesome stint in the majors. For example, the guy who tops our list of 600 AB Projected outfielders is Rusney Castillo. Castillo projected out to 100 runs, 33 HR and 100 RBI while hitting .333 and stealing 50 bases... none of those stats are going to happen. Nonetheless, it does tell you the impact he could have had in your lineup in his brief, 10-game stint with the Red Sox last year. Rusney Castillo may be a starter for the Red Sox this season, but he's 5'8", 186 lbs., so there's no way those projections will come to fruition. He may crack 10-15 HR with a .280 average and 20-25 stolen bases, so he's still a decent sleeper pick, but we just wanted to set the record straight that the 600 At Bat projections can be skewed if there isn't a significant cross-section of data to use (in Castillo's case, there were just 10 games of stats to dissect). The 600 At Bat projections may turn out to be useful for guys like Scott Van Slyke and JD Martinez. Scott Van Slyke may be forced into long-term duty in the Dodgers' lineup this season, so looking at his 600 at bat projections will help you understand what you can expect out of him if he plays on a more-consistent basis in 2015. Imagining him playing in 150 games last year as a full-time player, you wouldn't be too surprised to see his projected stats come to fruition (91 runs, 31 HR and 82 RBI). We'd expect fewer runs and HR, but not by a lot. Likewise, JD Martinez solidified himself as an everyday player in Detroit after last season, although it took him a while to get there. Projecting his 123 game, 441 AB season out to 600 ABs, and you'll see numbers you may be able to expect out of JD Martinez in 2015: 78 runs, 31 HR and 103 RBI. He may not hit over .300, but we still see his production being pretty accurate to the 600 at bats projections. In general, the 600 AB projections are helpful for guys who missed time with injuries as well as guys who got called up mid-season or guys who got nudged into a starting role somewhat unexpectedly. Now that we know AJ Pollock is (supposedly) going to be the leadoff guy for the Arizona Diamondbacks, his 600 at bat projections give us the most-accurate depiction of what to expect from him in a full season at the top of the order. 93 runs, 16 HR, 54 RBI and 32 stolen bases should be pretty accurate to what his 2015 fantasy stats look like. If anything, we see his stolen bases staying around the 20-25 mark, but we wouldn't be surprised to see him crack the 30 stolen base mark. Another guy to look at in our 600 at bat fantasy projection list is Pirates' outfielder, Gregory Polanco. The Pirates are a solid offensive team, and Gregory Polanco is slated to hit #2 in the lineup after Josh Harrison. Of course, with Andrew McCutchen hitting behind him, Polanco will score plenty of runs so long as he gets on base. Probably not the mathematically-projected 108 runs, but 90-100 is not out of the question. The other numbers seem doable (15 HR, 72 RBI), and we see his batting average rising to the .270 range, too. Also, 30 stolen bases may be a bit much, but 20+ is more than reasonable. As long as Giancarlo Stanton is healthy - both physically and mentally - after getting hit in the face with a fastball to end his 2014 season, he will lead the league in HR. Of course, for those of you who just wanna "goon it up" and go after all the power-hitters (which isn't a bad draft strategy, in all fairness), here's a brand new fantasy ranking system we put together. We call it the "Goon Rankings." It keeps track of the stats that everyone loves to see fill their box scores: Home Runs, RBI and Runs Scored only. We've all drafted that way at one point or another (if not annually), figuring that, if a guy hits a home run, that means he automatically scores a run and drives in at least 1 RBI. On top of that, it's also a base hit, so it also helps raise your batting average. You figure if you win those categories, stolen bases can go to hell in your fantasy league. 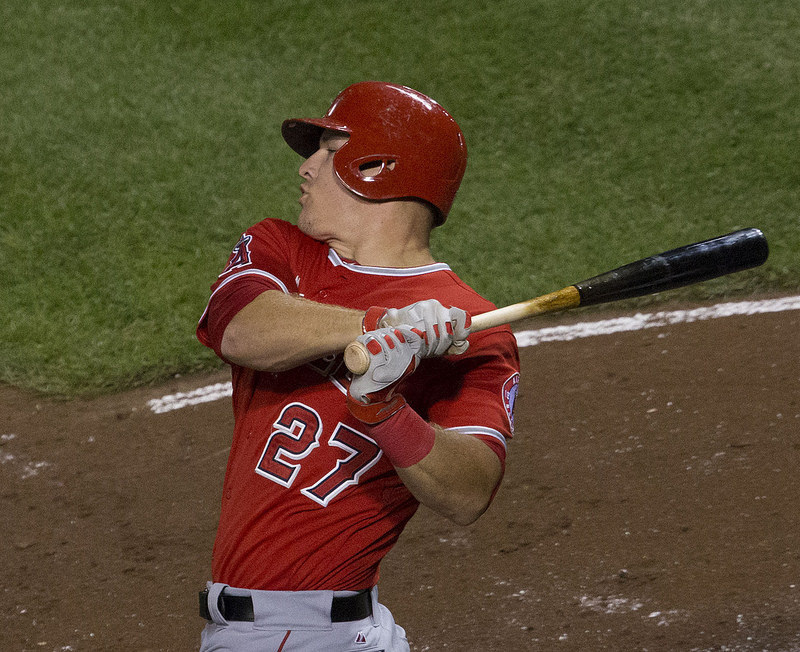 While Mike Trout abandons the speed game, his power numbers continue to improve. Ironically, the guy at the top of this list led the majors with 49 stolen bases 3 seasons ago. But there's no need to go all in-depth on a guy like Mike Trout. Draft Mike Trout and, if for some reason he decides to stop striking out so much in 2015, expect a boost in his numbers across the board. Just imagine what he would do if he dropped his strikeouts down from 184 to even 134. Give Mike Trout just 50 more balls in play and you're looking 40 HR, 120 runs, 120 RBI and maybe even 20-25 stolen bases. Now those are MVP numbers. 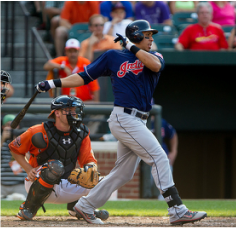 Michael Brantley was statistically the top 5x5 fantasy outfielder in all of baseball last year. Michael Brantley topped all outfielders in fantasy baseball last year in 5x5 stat production, although it didn't seem like it. Brantley simply filled up the box score with something every single day, it seemed, while on his way to a career year. He hit .327 with 20 HR, 97 RBI and 94 runs scored while also stealing 23 bases. Other than his batting average, none of those stats merits him a top pick individually, but when you see there are no weaknesses in his offensive output, you're going to have to draft him early or pay a pretty penny for him in an auction draft. Expect his average to drop to .300-ish, but the rest of the numbers should still remain. Baseball fans everywhere are hoping and praying that Giancarlo Stanton has fully recovered from his horrific injury near the end of his 2014 season. Physically, he'll recover just fine. Mentally, however, there's a long list of guys who were on their way to stardom when being hit in the head with a pitch ended everything. Stanton has the full confidence of the Marlins' front office who just dropped off a fully-loaded fleet of Brinks trucks to Stanton's home, so he has that going for him. The reason we say baseball fans everywhere are hoping and praying he's okay is because Giancarlo Stanton is the guy, now, who you wait to watch on SportsCenter just to see if he hit a home run. When Stanton hits a bomb, it's not just a standard-issue, 350-foot shot. It's usually some guided missile headed to Cuba or a towering monstrosity of a home run to dead center field that brings down a moon rock with it. 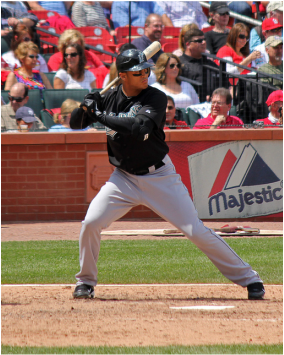 If Stanton is mentally, fully recovered, we see him leading the "Goon Rankings" next year with 50 home runs under his belt after the 2015 season. 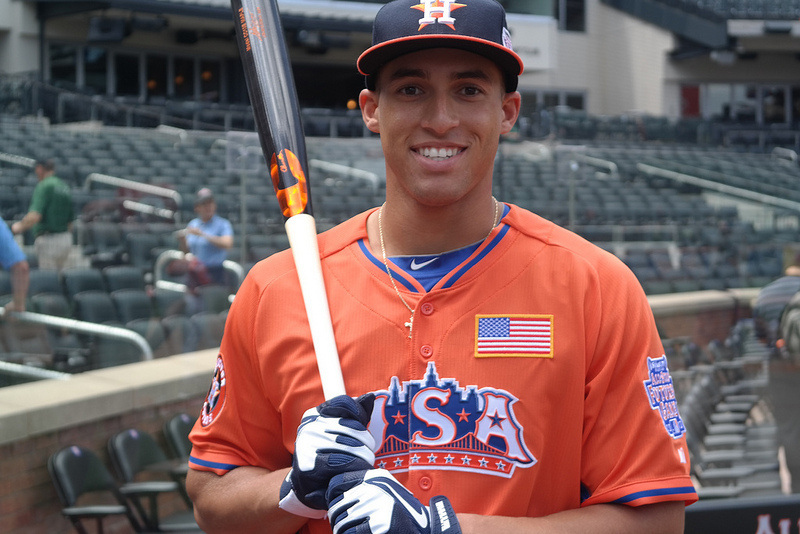 George Springer is the real deal, too, folks. Expect him to climb the Goon List next year, no problem. Springer is a 30-35 home run guy, although he's going to strike out about 180 times this season. He should see his batting average crack .240-.250 in 2015, and the Astros actually have a pretty exciting lineup offensively this year. They're going to be reminiscent of the early-90s Detroit Tigers with Rob Deer, Cecil Fielder and Mickey Tettleton who played all-or-nothing ball, crushing what they hit 450 feet and powering suburbs when they swing and miss. Everyone is talking about Matt Kemp and what he has to do to prove he's worth the trade to San Diego. Matt Kemp really just needs to stay healthy and he'll be himself. Justin Upton, on the other hand, is the one in San Diego who is expected to be solid, injury-free, issue-free and ready to go from week one through the playoffs for the Padres. Justin Upton has crazy power, and he should be just fine in San Diego, even if it is a pitchers' park. We fully expect (like everyone else) that Justin Upton will be the unquestionable constant in San Diego. The instant Matt Kemp pulls up limping in the field, and the instant Will Myers goes 0 for 4 with a pair of strikeouts, you just watch the media frenzy that starts predicting their respective doom. Justin Upton, on the other hand, will be just fine from wire to wire and will put himself back up on the Goon List for next season with 25-30 HR, 100 RBI and 85 runs scored. 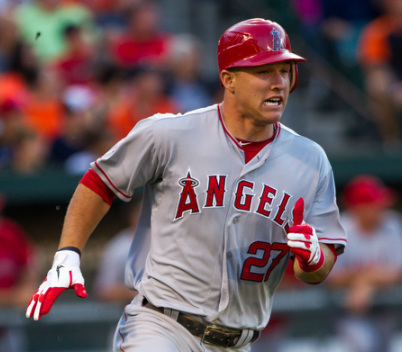 Mike Trout finally won his first MVP award in 2014. Finally... at the ripe, old age of 23.